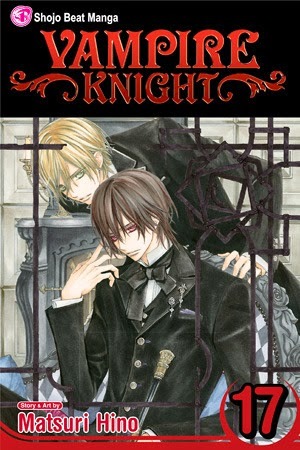 Having been with this series from the very beginning I must say the art simply improves with each installment. There are some gorgeous images on these pages, especially with Yuki and Zero and the pain etched in Kaname's eyes is especially touching. As for the storylines, there is now a sense of urgency as the series prepares to end soon. Zero has more of an active role once again and since he's one of my favorite characters, I'm glad. I haven't been a huge fan of the whole female progenitor story and the origin metal and the fire, but I'm tolerating, knowing the end is in sight. Sara is still exerting her annoying ways, this time even impacting Yuki and President Cross doesn't make me cringe now (he's become serious). I liked the scene with Kaname warning Zero about the pureblood blood he's ingested and how it can give one strength and also be poisonous. A nice subtle warning. Ruka surprised me with her brave action too. It's nice to actually say Yuki is maturing and stepping it up in these last few books. Yuri grew a pair when he stands up to Kaname and I have to remind myself why did I like Kaname so much in the beginning? Oh yeah, brooding, attractive, mysterious pureblood in charge of the Night Class. Though he's come a long way, the passage hasn't always been a clear one and tends to be confusing at times. Cover comment: Zero and Yuki, childhood friends back together. Foreshadowing? I know I rated this higher than the book before but this issue was frustrating to get through. I gave higher marks for the gorgeous art (as usual). Hino's facial portraits have matured and display a quiet ferocity when needed and incredible depth of emotion. The action scenes were a bit difficult to understand (particularly the battle scenes) and I did have to double check some of the characters since some do look alike. I did find the whole Yuki trying to capture Kaname moments a bit repetitive, especially when Zero joins in (the whole 'been there, done that' thing). We see Yuki's familiar and Kaname remarks how it, like Yuki, seeks the light. I will remark it would have different (less predictable) to have his familiar a butterfly and hers a bat. That would have been cool. I hate to say Kaname has become boring. Perhaps that's part of the reason he's tired and is on the track he's on. Sara is still around, trying to get Takumi to kill Kaname for her. Her story line does finally reaches its conclusion (yes!) and I wasn't sad to say farewell (ring the bell and repeat with me: ding dong, the witch is...). The scenes with Kaname and the female progenitor's spirit were cool. There was a lot going on involving the hunters, the Night Class, Kaito, the whole Sara thing, Isaya returns only to throw a masquerade ball and set a trap. There's more going on with Zero, Yuki, and then there's Kaname's quest. Whoa, this installment just had a LOT going on which would have been better served over two books at least. The masquerade came out of no where (No Where), didn't do much to move the story, and ended too quickly. What redeemed this book were the scenes between Zero and Yuki, starting with the cover. I loved their whole childhood back story, how she 'saved' him and continued to save him whenever necessary. When he asks her to dance, I was as surprised as she was and Hino's art perfectly captured this moment. I also adored the montage of their past together and these panels reminded me why I began reading this manga--for the art and vampires. I would've liked some more development of some of these stories and the ending of this book was heartbreaking. Yuki, how could you? Cover comment: Special cover! Wrap around. Nice! There were times when reading some installments I wanted to see things wrapped up and here they are. Wow, the end. And though it's far from perfect, it's packed with emotion, and some confusion. President Cross wants to shut the school since the Hunters lost their headquarters. 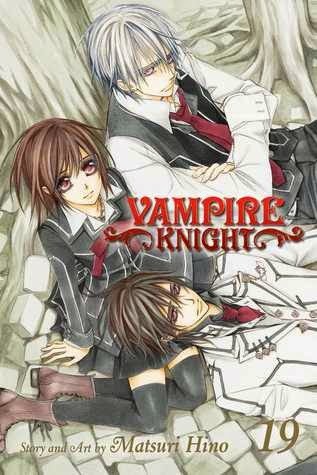 Cross goes to meet Kaname in the school woods and brings Yuki along to eavesdrop. Yes, the truth is revealed about Kaname and it was, I'm sad to admit, anti-climatic. But hold up, because the scene immediately afterwards changed things up a bit and I had to re-read some sections for the believability factor and to help me understand that ending. But before I jump ahead, Kaname and Yuki fans get their special 'moments' for quite some pages and the emotion displayed in these panes made reading this series all worthwhile. I'll comment here by saying their moment could have had more impact, more power, if there had been a longer break between these two seeing each other. For me, it once again seemed to move way too fast, like a horse galloping for the finish line. I wanted their moments to take my breath away and they didn't. Yes, they were emotional, but didn't pack the emotional fireworks I expected. I loved the scene where Kaname tells Yuki something about her smile and Zero which made my heart go POW! (cartoon balloon). As the story races to its conclusion, I must say that last day was a really nice way to end the series. I won't forget the image of Kaname hugging both Yuki and Zero and his exclamation to her. I need to comment on the rushing of everything here though, again, which left me with more questions than were answered. And then the other ending tacked on which takes place how many years later? Why not give the readers one more volume and show us this huge time period? Consider me confused and a bit miffed at this section which felt like a tacked-on epilogue. Again, where's Zero? Yuki? I get the idea of the ending, I may not necessarily care for it, but it needed more to have me fully 'get' it. Hino's art really stepped up and tagged the drama, rendering it across the pages. It was the story line I had issues with. 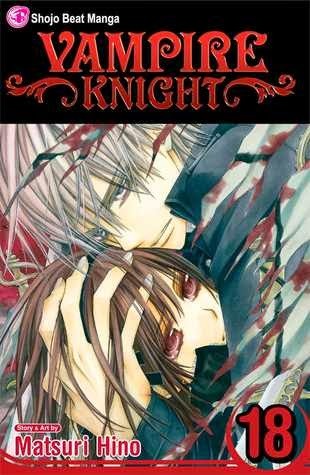 I loved the art of Vampire Knight and shall always cherish it. Part of me is sad to say goodbye to this series, another part of me is happy to be able to go read something else. Thank you, Matsuri Hino, for the memories. I've always loved the art of Matsuri Hino. I agree with you about the conclusion though. *sigh* This is a heavy piece of a story.